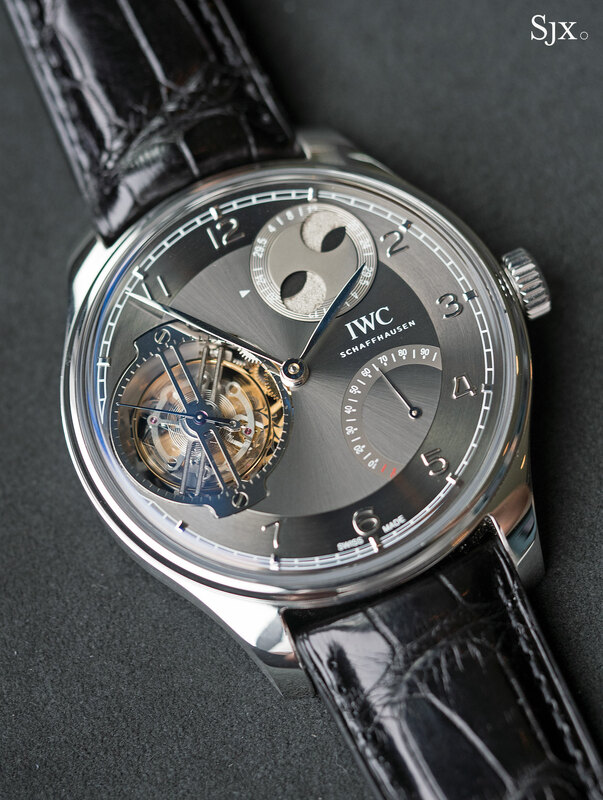 The compact and cleverly designed IWC tourbillon with integrated constant force returns. 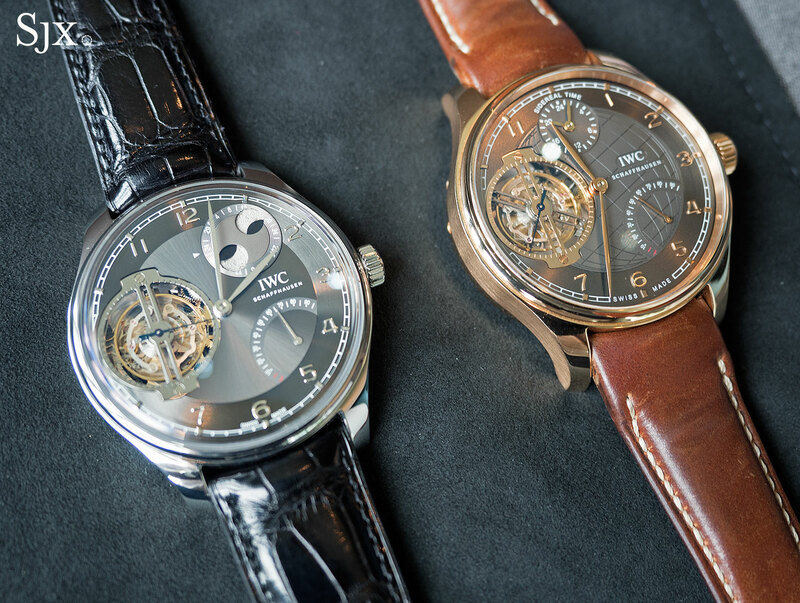 Although featuring a constant force tourbillon, moon phase and a four-day power reserve, the Portugieser Constant-Force Tourbillon is a dialled down version of the most complicated (and expensive) IWC wristwatch ever made, the Portuguese Sidérale Scafusia introduced in 2011. 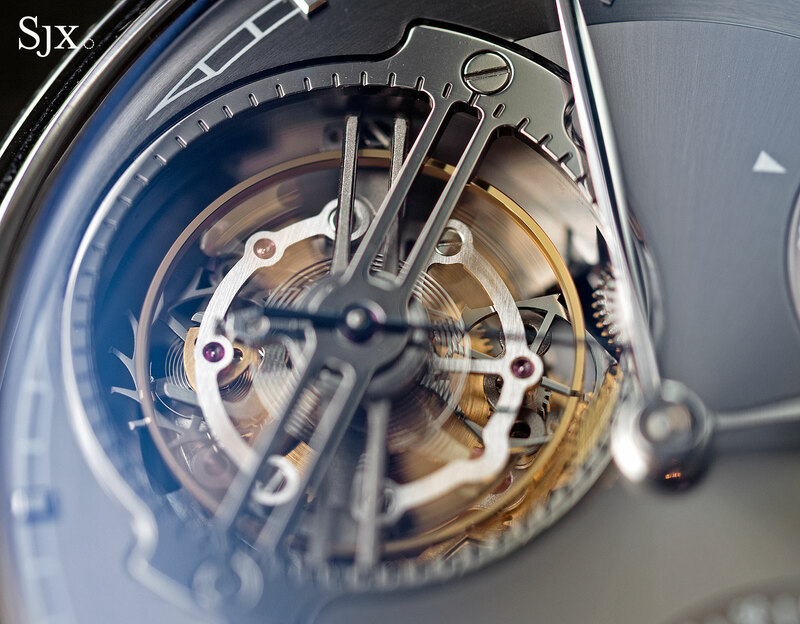 Powered by the same calibre 94800 found in the discontinued Ingenieur with the same features, the Portugieser Constant-Force Tourbillon has an aperture at nine o’clock that reveals the centrepiece of the movement, a large tourbillon regulator. 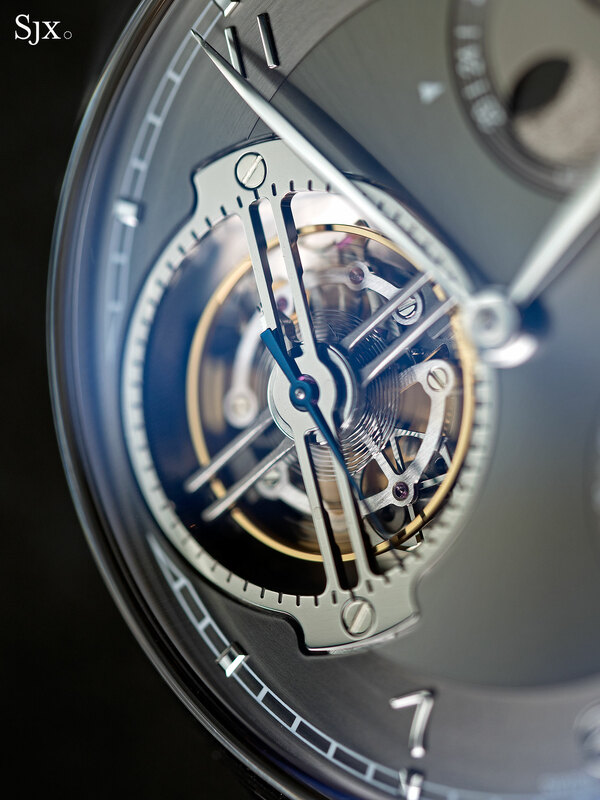 Though the tourbillon itself is large, the cage measures almost the radius of the dial and the balance wheel is only slightly smaller, the construction is compact, with the constant force mechanism integrated into the tourbillon. 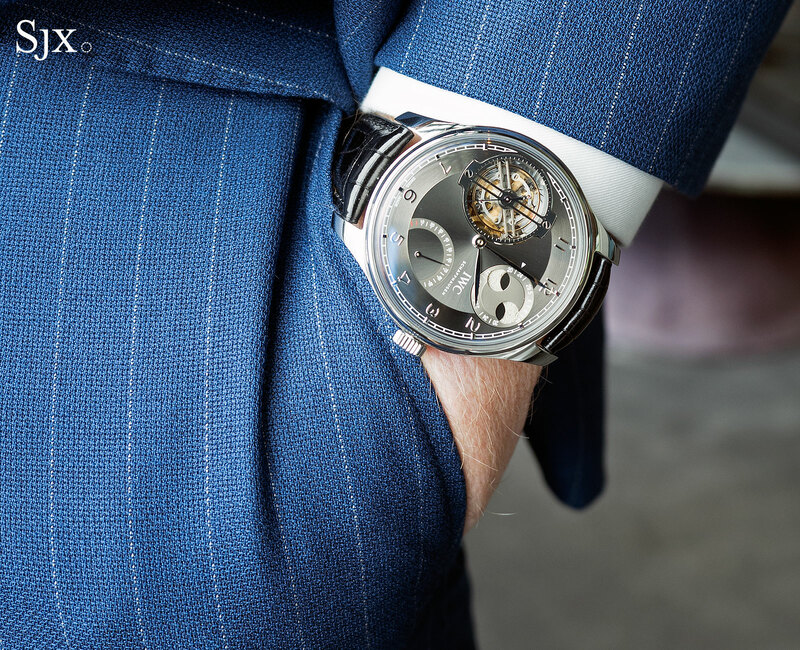 Developed in collaboration with complications developer Chronode – founder Jean-Francois Mojon worked at IWC for a decade before starting Chronode – the tourbillon has a tiny spring mounted under the escape wheel. Once a second this spring accumulates and releases power from the mainspring, ensuring that the escapement is driven by a small, steady supply of energy. This in turn keep the balance beating at a constant amplitude, and also gives the tourbillon cage a rotation that moves in one-second steps. 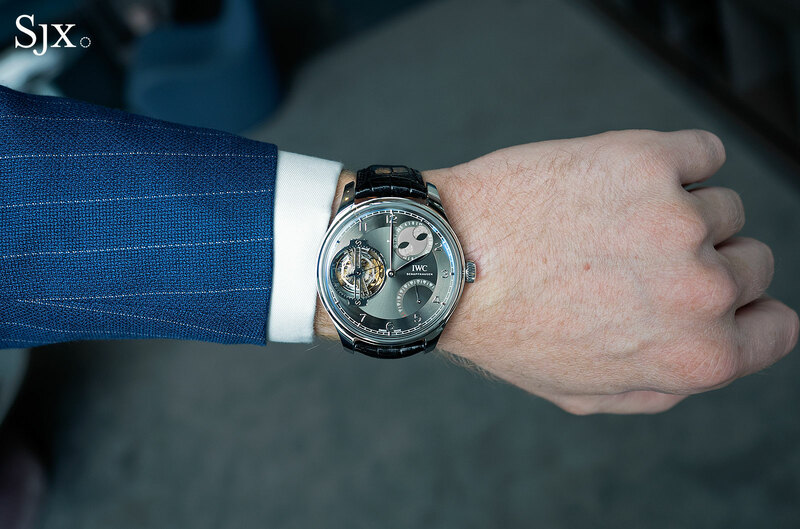 That only holds for the first two days of the 96-hour power reserve, when the mainspring is sufficiently wound to provide enough power to keep the constant force mechanism going at an optimal rate. Once the two-day mark is passed, the constant force disengages and the tourbillon functions like a conventional tourbillon. At one o’clock is the double hemisphere moon phase, with the moon phase disc cast to resemble the cratered surface of the Moon. And just below that is the power reserve display. 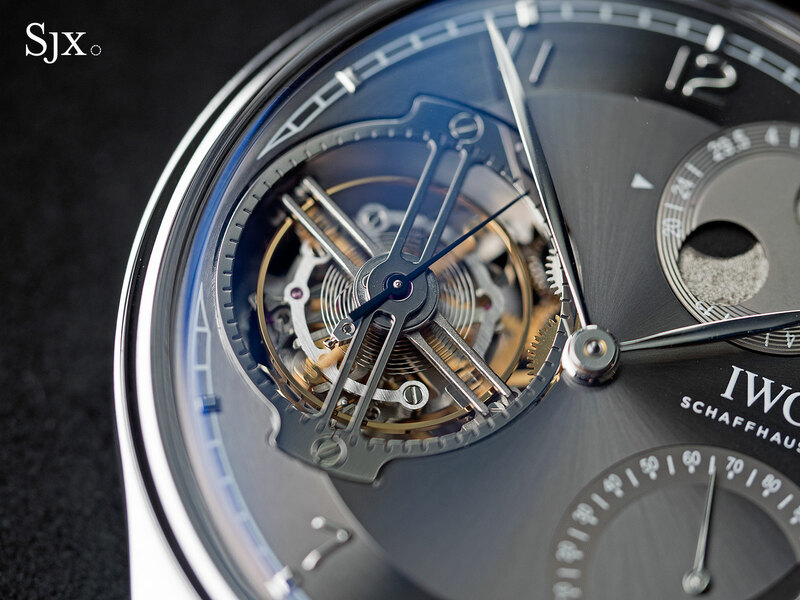 Unlike the Portuguese Sidérale Scafusia that incorporated a star chart on the back of the watch, which is why it is an enormous 17.5mm in height, the Portugieser Constant-Force Tourbillon is a relatively slim 13mm, even with the high domed sapphire crystal. 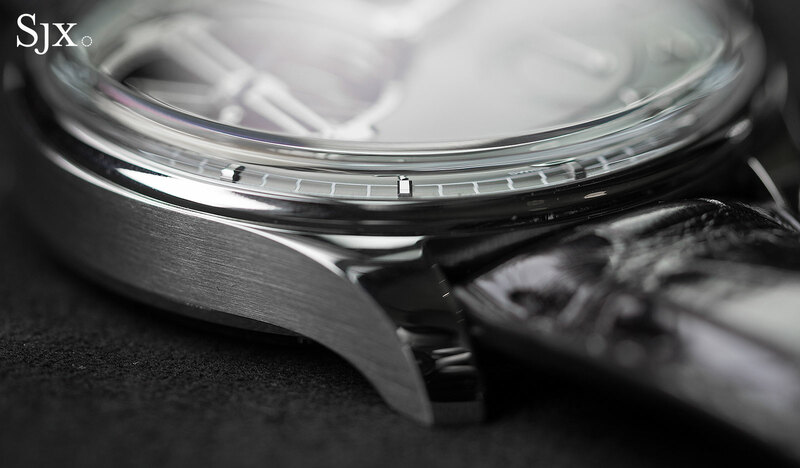 The case is a large 46mm, which gives it relatively elegant proportions though it is still a large watch. 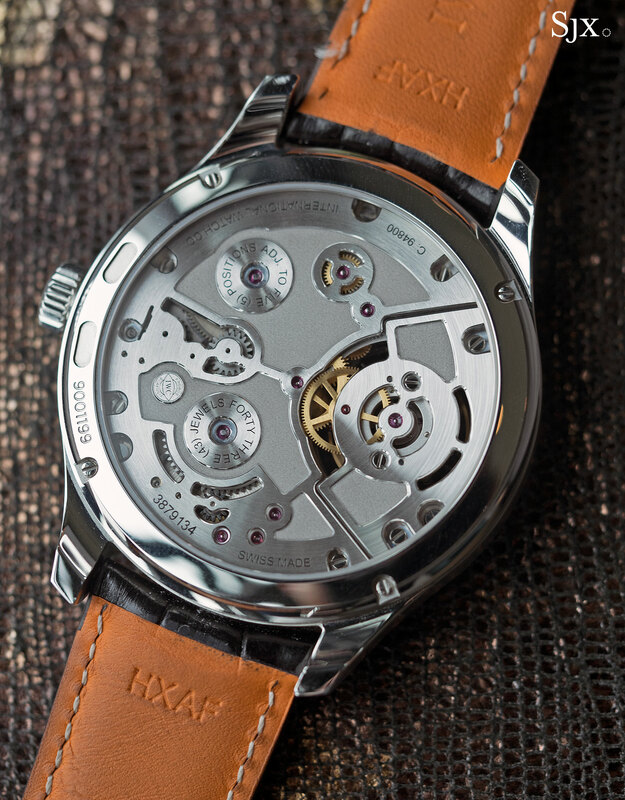 The back reveals the movement and its workmanlike finish. 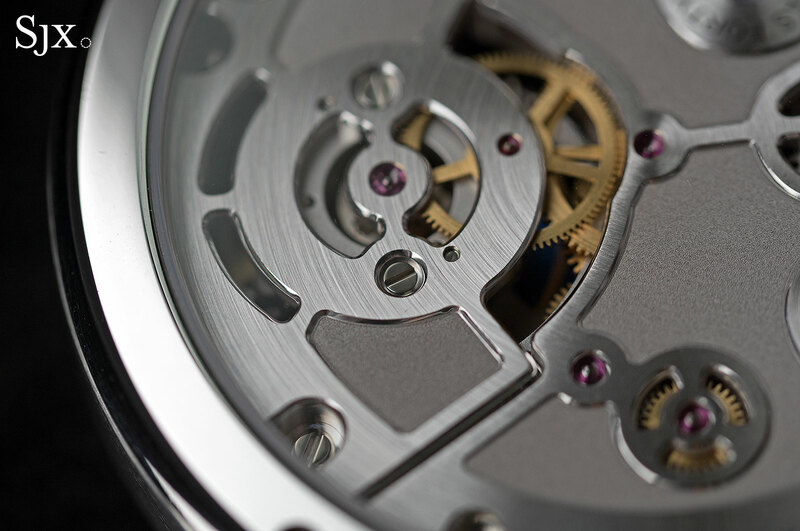 Historically IWC has never been associated with decorative finishing – clever and concise engineering was its thing – so the functional appearance of the movement is in keeping with the brand’s identity. 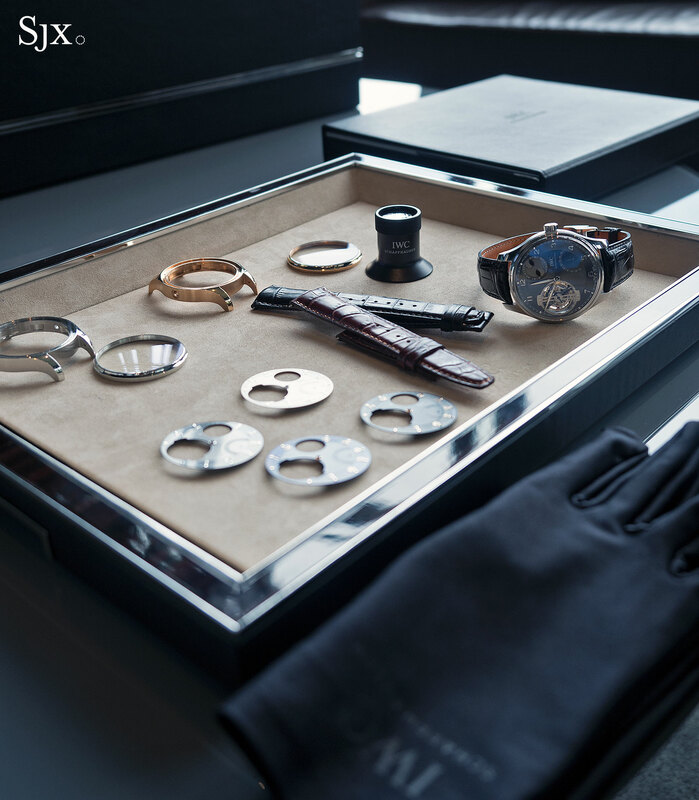 Even if not fancy the movement is attractive, with variation of the surfaces finishes that create an appealing contrast. The overall finishing is careful, albeit applied by machine. That being said, the styling of the movement, which is reminiscent of an automobile engine, doesn’t quite suit the classical design on the front. 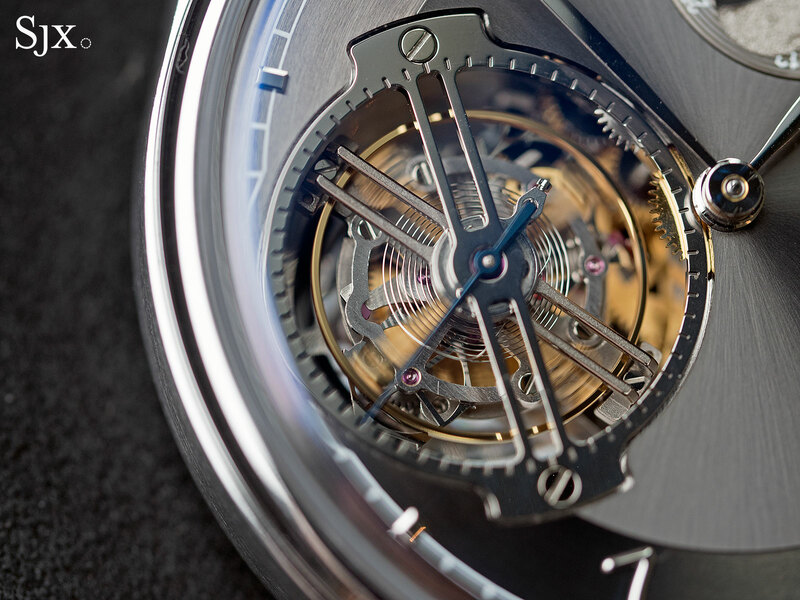 And that explanation for that is likely that the calibre 94800 was originally designed for the Ingenieur Constant-Force Tourbillon, a high octane-high complication. The Portugieser Constant-Force Tourbillon is customisable, with the client able to mix and match for the case, dial and strap. The case is available in red gold or platinum, with the choice of four metallic finish dial colours, as well as a wide range of straps. Further customisation beyond the options offered is possible, but likely at significant additional cost. The prototype of the Portugieser Constant-Force Tourbillon is in stainless steel, which unfortunately is not an option for the watch. 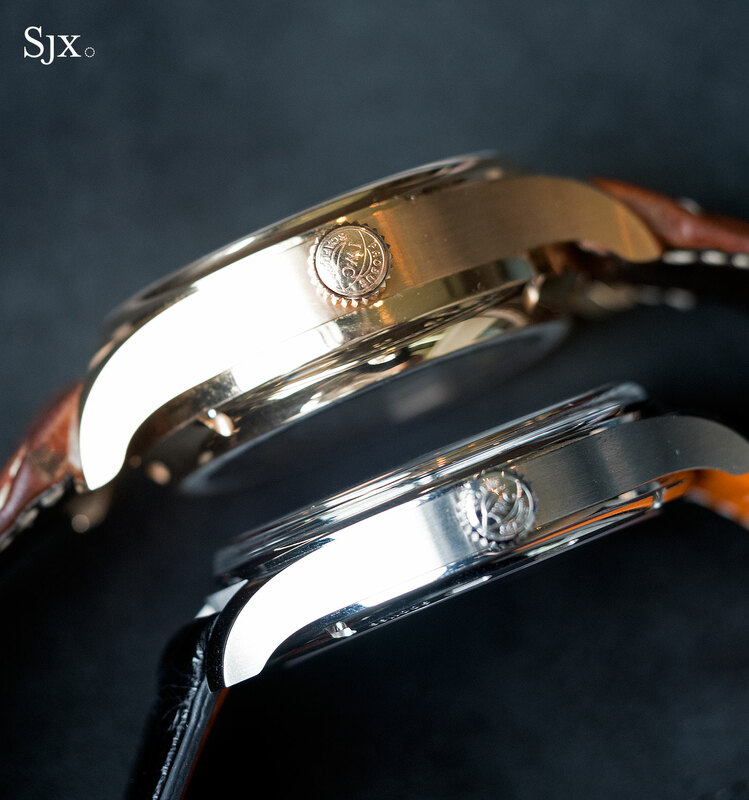 The lightness of the steel case makes it more wearable than the precious metal versions. 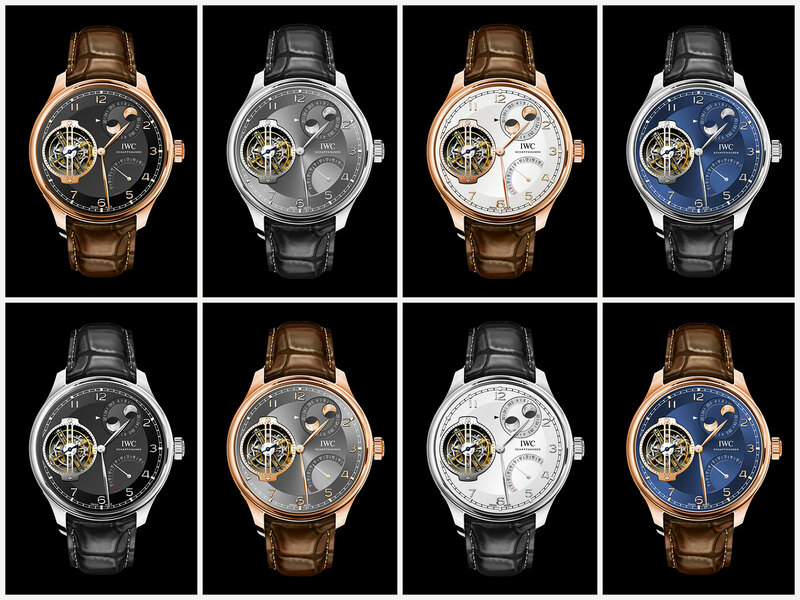 The Portugieser Constant-Force Tourbillon (ref. IW5901) is made to order, priced at S$325,000 in red gold and S$360,000 in platinum. Those are equivalent to US$230,000 and US$260,000 respectively.